So, hey. We've got a new idea for this Halloween. We're thinking we'd like to team you up with Mr. KJU. And, well, not just team you two up. Because we're thinking, actually, that he wouldn't mind giving you a ride! And we have just the way to do that. Because we have this costume ready to create that illusion! 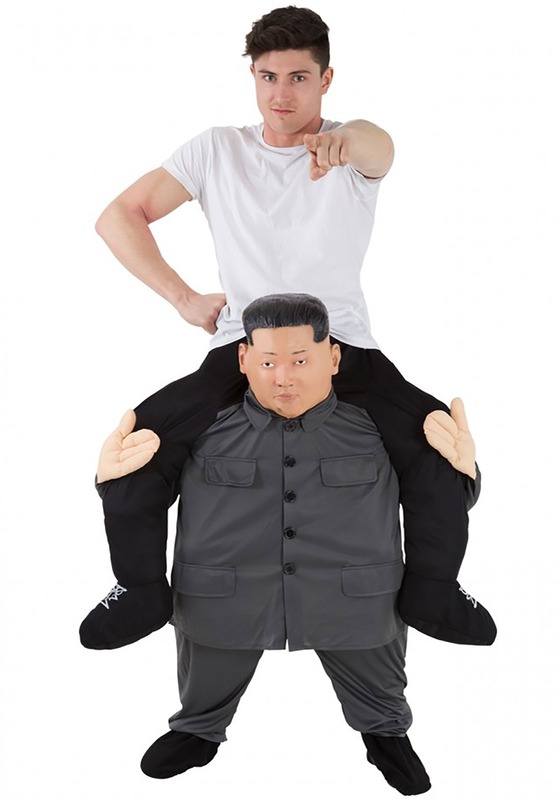 From the Morphsuits company, this costume is the newest creation in their line of Piggy Back Costumes. These simple costumes create the illusion of you sitting on the shoulders of a short character's shoulders. And that's because they're enhanced costume pants! That's achieved with a soft molded vinyl head attached to the pants, and a stuffable extra set of legs. The pants fit with a drawstring waist and come in one size to fit most adults. It even has attached shoe covers, so all you'll need to complete the costume is your favorite t-shirt.